As of December 18, 2013 the ASPECT store is closed permanently. Thanks to all of our customers over the past 11 years. If you would like to order an issue of ASPECT, please contact us or contact Old City Publishing. ASPECT: The Chronicle of New Media Art, a biannual DVD publication, is currently accepting submissions of time-based work for V21: A GOOD PLACE TO STOP. After ten years, twenty-six DVDs, and the published works of over 200 artists, ASPECT: The Chronicle of New Media Art reaches its conclusion with Volume 21: A Good Place to Stop. We are currently accepting submissions that explore the concept of endings. We will review installation, video, performance, sound and any other work best documented in time-based format. 27 DVDs for only $500! As we enter our final year of publication, ASPECT is excited to offer a limited-time sale on our entire collection. Get every DVD ASPECT has ever published PLUS the last two volumes (to be released in Fall 2012 and Spring 2013) for just $500! Help us raise the funds we need to get our last two issues to press. This is the best deal ASPECT has ever offered. The entire collection features work by 221 artists from our 10 years of publication. 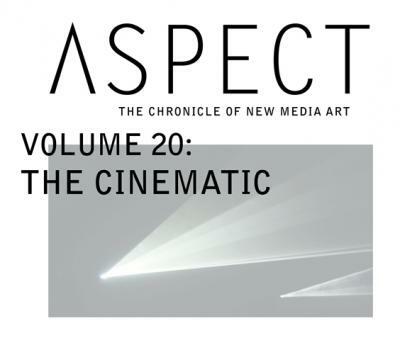 ASPECT: The Chronicle of New Media Art, a biannual DVD publication, is currently accepting submissions of time-based work for V20: THE CINEMATIC. New genres of artmaking are heavily informed by the cultural, formal, and theoretical issues surrounding popular cinema. We seek works that explore the complex relationship between cinema and new media. We will review installation, video, performance, sound and any other work best documented in time-based format. ASPECT asks artist/commentator pairs to submit proposals of time-based work. Commentators may be curators, historians, critics, or educators who can offer a distinct perspective on the work. Criteria for selection will include the qualifications of the commentator and the quality of the work. Audio recordings of the commentary will be assembled after the submissions have been selected. After ten years, twenty-six DVDs and the published works of over 200 artists, the staff and board of ASPECT have decided to stop publishing our DVD periodical. Looking back on what we have accomplished, it is no understatement to say that we took on the art world and changed the way it looks at new media art. When ASPECT published our first DVD in 2003 there were few, if any, dedicated new media programs at the graduate or undergraduate level in the world. Youtube and Facebook did not yet exist. At that time the idea of getting video directly from artists and publishing it for the use and consumption of universities, students and other artists was considered impossible. A DVD periodical was an unknown idea, and it took several years to educate the public as to the potential of such a format. ASPECT-EZ is a new series of events and DVD publications coordinated by ASPECT to provide support for emerging artists. These events will be under the auspices of the curatorial team at ASPECT, and produced by young interns and guest organizers. Deja Vu is the fourth installment of ASPECT-EZ. For this volume we are seeking time-based works that explore repetition, ritual, nostalgia, found footage, or time in general. Work selected for the event will be featured on a limited-run DVD, published by Aspect. Any art that is best captured with time-based media is suitable for the show. Work or documentation of work should be under 5 minutes, unless convincingly argued otherwise. We will also accept proposals for live performance or installation to be exhibited at the event, the documentation of which will be featured on the DVD. ASPECT-EZ is a new series of events and online projects coordinated by ASPECT to provide support for emerging artists working in time-based media. 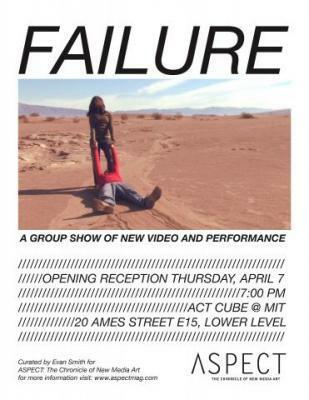 FAILURE is the second installment of ASPECT-EZ, featuring works that explore chance, failure and idealism as generative forces in video, performance and new media. This is a one night screening event at the ACT Cube at MIT. ASPECT-EZ is a new series of events and DVD publications coordinated by ASPECT to provide support for emerging artists. These events will be under the auspices of the curatorial team at ASPECT, and produced by young interns and guest organizers. text + image is the third installment of ASPECT-EZ. For this volume we are seeking time-based works that explore the relationship between text and image. We are excited to announce the launch of the ASPECT app for the iPad. This new system allows you to gain access to the entire ASPECT collection on your iPad at an inexpensive flat rate. An invaluable educational tool, the app functions as a unique primary source textbook of new media art. Search and browse the entire ASPECT catalogue and create your own playlists of time-based artwork. Purchase access for one day, a semester, or an entire year for yourself or your students. Available now through the ASPECT website or the iTunes store.